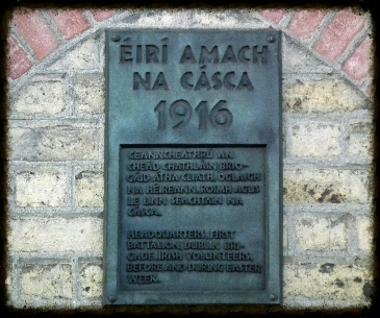 From 3 May to 14 May 1916 fourteen leaders of the Easter Rising were executed in Kilmainham Gaol. All were given succour by priests in their cells prior to execution, with the exception of James Connolly who was imprisoned in Dublin Castle until he was taken to the Stonebreaker’s Yard in Kilmainham Gaol to be shot. He was seen by his priest in Dublin Castle. The first three to be executed, Patrick Pearse, Thomas Clarke and Thomas MacDonagh, did not receive the Last Rights of the Catholic Church after their executions because of the orders of the Gaol Commandant – but all the others did with the exception of James Connolly who was visited by a priest in DUblin Castle. Most of the Friars who attended those to be executed came from the Capuchin Franciscan Friary of the Church of St Mary of the Angels, located at 138–142 Church Street. Adjacent to the Priory, at 131–137 Church Street, was Fr Mathew Hall, also known as Capuchin Hall. The Hall was used as a hospital during Easter Week. There is a plaque on the wall which commemorates its importance during the Rising, as the Hall was the headquarters of the 1st Battalion under Cmdt Edward (Ned) Daly before the Battalion moved on the Friday to the Four Courts. The Friars who attended those executed in Kilmainham Gaol lived here, and they were instrumental in bringing the British and the Battalion O/Cs together at the end of the Rising. Fathers Albert Bibby, Aloysius Travers, Augustine Hayden, Columbus Murphy and Sebastian O’Brien accompanied the various men and women carrying the cease-fire orders, and they also ministered to the leaders in Richmond Prison, Kilmainham Gaol and Dublin Castle. Priests throughout Dublin ministered to the Irish during the fighting, but the Catholic Church was almost uniformly opposed to any physical force action against the British, and the majority of Catholic bishops remained loyal to moderate and constitutional politics. Of the thirty-one bishops in Ireland at the time, only one (Dr Michael Fogarty of Killaloe) gave a hedged condemnation of the Rising, and one other (Thomas O’Dwyer, Bishop of Limerick) could be said to have partially condoned it. Dr William Walsh, Archbishop of Dublin, had expressed nationalist feelings, but he thought the Rising ‘madness’. Moreover, the Church had been one of the staunchest opponents of James Larkin, and Connolly’s socialism was anathema to the Church hierarchy. 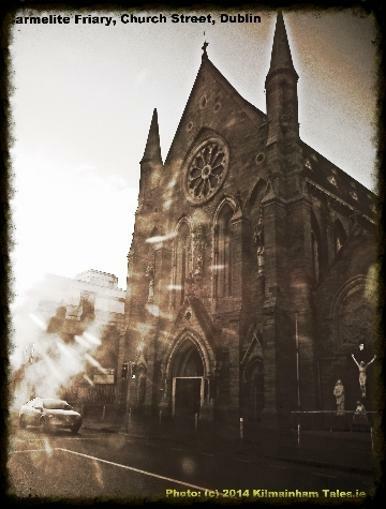 The Church’s hierarchy, under the leadership of Michael Cardinal Logue, Bishop of Armagh and Primate of All Ireland, held that the Rising was unjustified because none of these required conditions was met. In contrast, from the re-establishment of Irish Province of the Capuchin Order in 1885 there had been strong links between its members and the emerging national movement. It was clear that the cultural resurgence associated with the Irish Ireland movement deeply influenced the men who were drawn to Capuchin religious life. Even before the Province was re-constituted Fr. Albert Mitchell, an ardent nationalist, made a particular point of always wearing Irish made garments and vigorously championed home-made products. Later, Fr. Aloysius Travers preached a ‘buy Irish Campaign’, while Fr. Edwin Fitzgibbon played a leading role in promoting Gaelic games. Many of the friars were fluent Irish speakers and Fr. 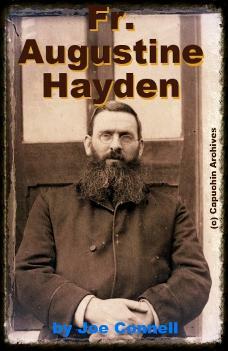 Augustine Hayden and Fr. Albert Bibby were to the forefront in fostering interest in the native language through the Gaelic League (Conradh na Gaeilge). Fr. (later Msgr) Patrick Browne was a particular friend of Seán MacDermott and ministered to him and Cmdt Michael Mallin.in their Kilmainham cells. Many of the priests completed Witness Statements at the Bureau of Military History, and the Capuchin Friars noted their memories in various issues of the Capuchin Annual. Go to the links below for the stories of Frs. Augustine, Albert, Columbus, Aloysius and Fr. Dominic, as well as Fr. Patrick Browne (who was not a Capuchin). Note from Kilmainham Tales: These stories are abbreviated from Joe Connell's book "Rebels' Priests - ministering to Republicans 1916-24", details are here. We are grateful to the Capuchin Archives (and Archivist Dr. Brian Kirby especially) for their co-operation in this project. Many of the illustrations used here and in the book are theirs, and we were given use of these with a freedom that we wish many other archives would copy. In addition, Kilmainham Gaol & Archive, through Niall Bergin, freely co-operated through supply of other material used here and in the forthcoming book. Our thanks to both and all others who helped. "Rebels' Priests - ministering to Republicans 1916-24"